Lolam is an underground film maker and editor whose passion is filming all kinds of alternative artists. She has interviewed Didier Wampas, sketched a number of rock and punk portraits and also directed broadcast reports on humanitarian issues. She is the co-founder of the group “Association Les Ménilmonteurs” which promotes aerial dance, film making and plastic arts. Since collaborating on a documentary film about the graffiti artist Shaka, she has taken a growing interest in street art. She also directed two short videos for the web site Fatcap, on location at the Piscine Molitor, an abandoned Parisian swimming complex. One was made for the "Journées du Patrimoine" cultural event in 2010, and the other for a live-painting created by Nosb in 2011. 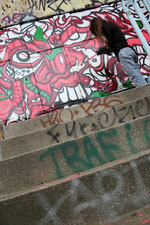 She also collaborated with Fatcap as director of a documentary about the Polish stencil artist M-City. 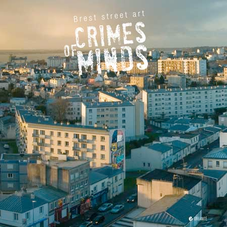 Produced for the Galerie Itinerrance, the film focused on paintings created in the 13th arondissement of Paris and the nearby town of Montry. Her artistic sensitivity, allied with an innate sense of rhythm, gives a sense of fluidity and thoughtfulness to her work. She prefers the beautiful simplicity of human movement to smoke-and-mirrors effects. Her editing focuses on the individual movements of her favourite artists, and she certainly does them full justice with her intuition for capturing motion on film.